Figure 4 shows a third example of the use of KOH-eluent generation in HPAEC-PAD. Patil and Rohrer used a 4-µm-version of the Dionex Carbopac PA20 to optimize the separation of glycoprotein monosaccharides and amino sugars in HCl and TFA hydrolysates. The smaller particle size of this column offers higher peak efﬁciencies, leading to high-resolution separations and allowing a shorter column format and, ultimately, signiﬁcantly shorter run times. It results in baseline-resolved peaks that elute within six minutes off the column. The total run time of 20 minutes allows for washing and re-equilibration after the column regeneration step. 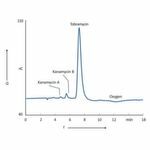 The chromatogram shows not only the region where the monosaccharides and amino sugars elute but also the column wash and re-equilibration . Aggrawal and Rohrer demonstrated the use of RFIC for HPAEC-PAD for the analysis of mono- to oligosaccharides in honey. Using a Dionex Carbopac PA210-4µm to separate low concentrations of carbohydrates in the presence of high concentrations of glucose and fructose, this method enabled the detection of honey-adulteration by the addition of industrial sugar syrups . In all the above-demonstrated cases the user-independent inline and high-pressure electrolytic eluent generation of KOH-eluents, both isocratic and gradient, provides accurate eluent concentrations and precise retention times, which are prerequisites for reproducible and reliable analytical data. The elution of oligo- and polysaccharides requires the use of a “pushing ion”, like acetate or nitrate [5,20]. The “pusher” accelerates the elution of strongly bound species without compromising selectivity or interfering with the pulsed amperometric detection. Until recently applications requiring such eluent compositions had to be performed using manually prepared eluents. With the Dual Eluent Generation Cartridge (Dual EGC) mode of operation (Figure 5, online), electrolytically generated eluents become available for the analysis of complex carbohydrates. In this new mode, RFIC systems employ a methanesulfonic acid (MSA) and EGC KOH cartridge, in series, to electrolytically generate KOH/potassium methanesulfonate (KMSA) eluents. This operating mode is applicable with capillary (0.4 mm) and analytical column formats (1.0 mm). Huang et al. 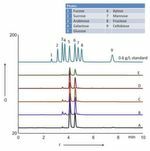 demonstrated its use for proﬁling galactosyl-oligosaccharides (GOS)  and the analysis of N-linked ­oligosaccharides from glycoproteins , with a Dionex Carbopac PA200 column set in the 1 mm format. As a representative example for the elution for even stronger retained poly­saccharides, Figure 6 (online) shows an inulin-separation in the dual EGC operation mode. 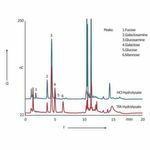 Applying electrolytic eluent generation to HPAEC-PAD improves the consistency of producing low KOH-concentration eluents and KOH gradients for the elution of smaller saccharides. In addition, the method is shown to be user-independent, reproducible and robust in terms of retention time and peak area precision. The Dual EGC mode enables an analyst to run gradient methods using electrolytically generated KOH/KMSA to elute stronger retained oligo- and polysaccharides. This offers greater reproducibility, eliminates manual preparation of eluents, and maximizes instrument uptime. The Dual EGC mode shows excellent performance for HPAEC-PAD of complex carbohydrates. In its different modes of operation, RFIC improves the reproducibility of HPAEC-IPAD analyses and ensures greater accuracy and comparability between instruments as well as laboratories.